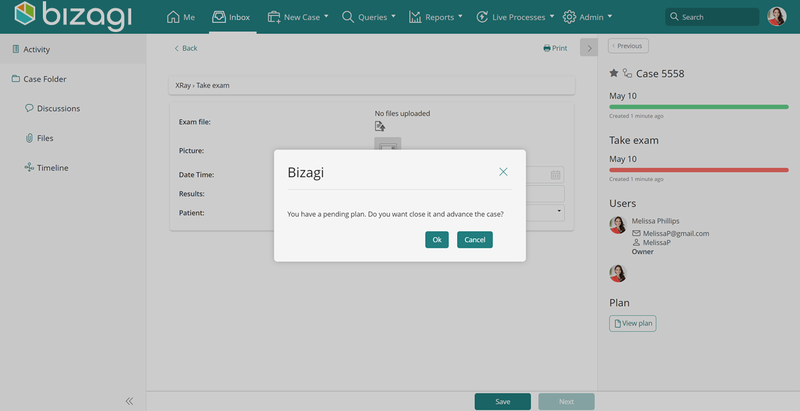 Bizagi introduces a powerful and very dynamic capability that allows you to create ad-hoc plans, to help you control a series of on-the-fly activities directly from your Work Portal, as described at My Plans. 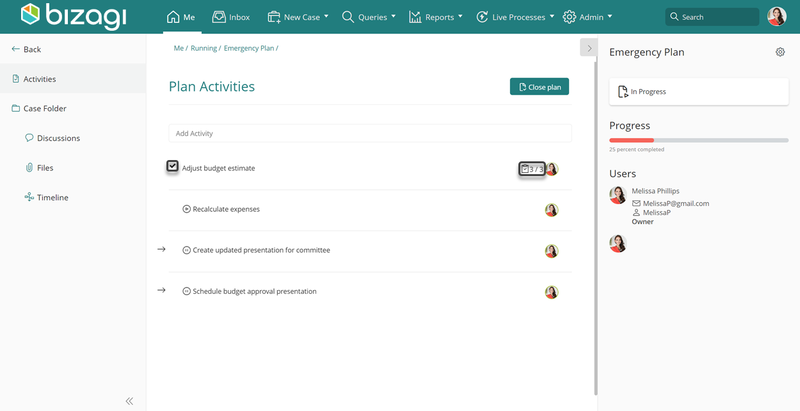 To learn instead how end users work with appointed Plan's activities, refer to Working with running Plans. Whenever the owner of a Plan considers that the Plan's goal has been reached, he/she may choose to close it (even if all of its inner activities have not been finished). If a Plan is closed, all allocated activities will no longer appear at each responsible user's Inbox. When managing a Plan, you may acknowledge which activities are completed by identifying the tally mark next to the activity's name. Similarly, those activities having a Checklist will display the number of items completed out of the total number of items. 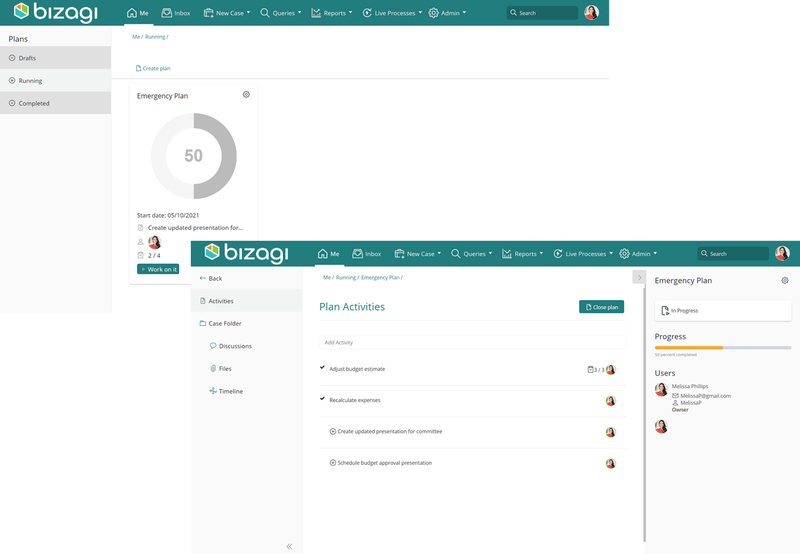 For Plans which are part of process activities, Bizagi prevents its originating activity to be completed (i.e, when clicking Next) unless the Plan has been completed/closed beforehand. 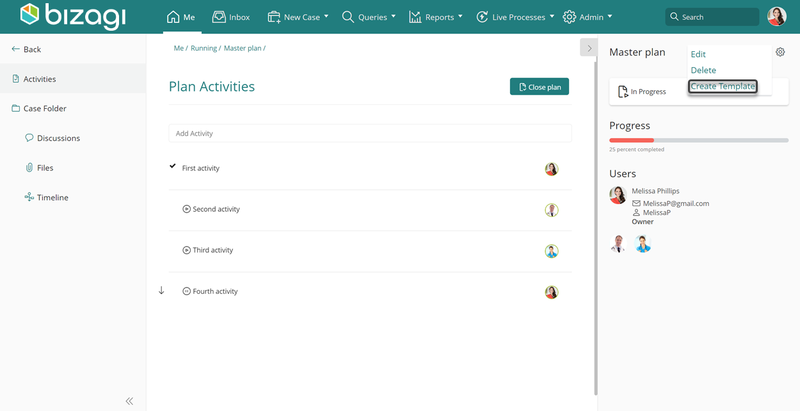 Notice that end users which are not Stakeholders will not have the Me menu, and therefore they should access Plans they have created from within the originating activities. The owner of the Plan can add activities anytime, as long as the Plan is in a Draft or Running status. The owner can also change due dates, goals and allocated users as long as the activities have not been already allocated. 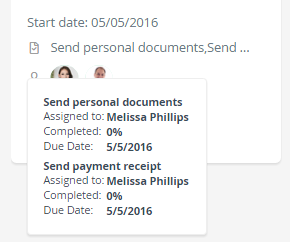 Editing details of a Plan is done by clicking on that Plan and using the same interface as used when defining it. A Plan under any status, can be saved as a template so that its content becomes available to further new Plans. In order to do so, click on the gear icon from the Plans listed on the Me menu, and click Save as Template. Note that alternatively, you may save the Plan as a template from the options displayed when viewing the Plan (you may need to click first on Plan Summary if standing in an inner activity). The owner of the Plan can choose to delete it, especially if he/she detects that how it was created nor its information, add any value. To do so, click on the gear icon from the Plans listed on the Me menu, and click Delete. 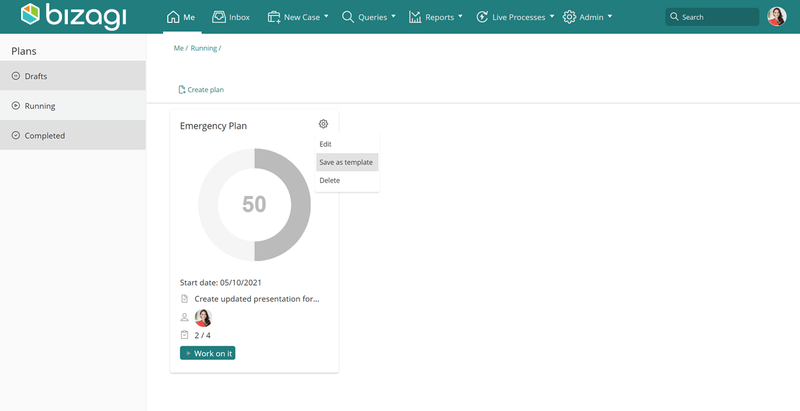 Plan present the following detail, especially useful to track a Plan that is in a Running status. •Progress: Applicable to Plans which are in a Running status. It displays the percentage of accomplished activities of that Plan (versus the total of activities). The image above shows a 25% progress. The relevant date for a Plan under Drafts status, concerns when it was last updated. The relevant date for a Plan under Running status, concerns when it had technically started. 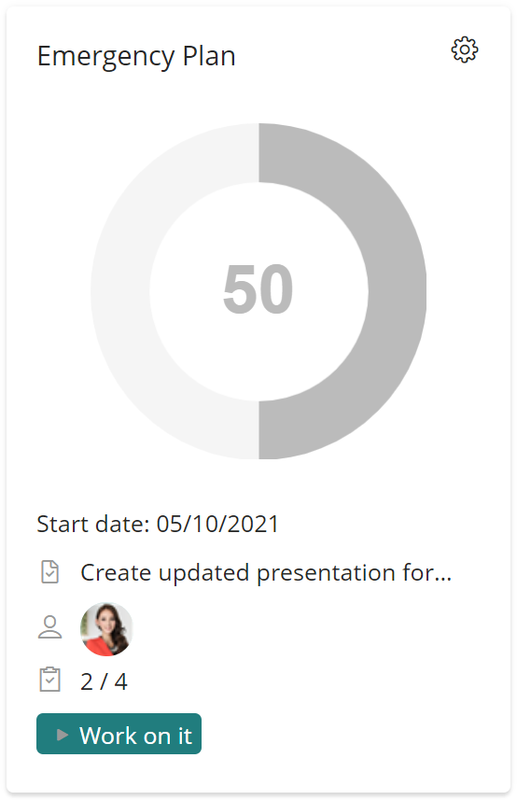 The relevant date for a Plan under Completed status, concerns when it was closed. •Current Activity: Displays the activity where the Plan is currently at. When hovering over this detail, a description of the activity is shown (or activities if there are some pending in parallel). •Participants: Displays the pictures of those end users who are responsible of carrying out at least one activity of the Plan. 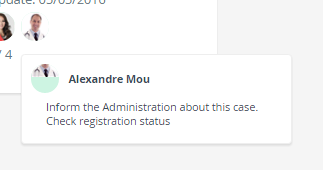 When hovering over this detail, the full name of the user is shown, along with the specific activity which was appointed to that user. •Completed activities: Displays the number of activities finished along with the total number of activities for that Plan. Calculating a division between them, leads to obtaining the progress percentage of the Plan.